We had a lovely afternoon peeping into type cases and chatting to the volunteers who run the museum, and who are very enthusiastic and keen to share their tips with novices like us! 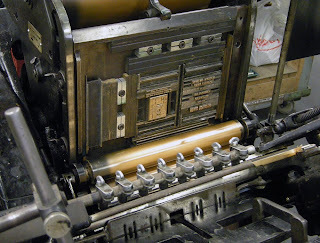 They had a nice little Heidelberg press up and running (above) - they don't turn the huge ones on for big public open days (health and safety), but one of the volunteers said that they do run them during the museum's normal opening hours (Wednesday mornings). There are some more photos in our Flickr photostream. 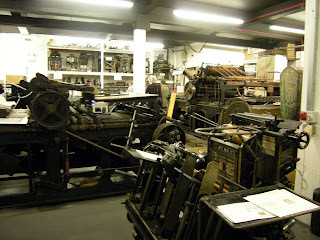 Do go if you ever get the chance, it's a lovely little place, and packed to the gunwales with presses and type and cameras and litho stones and guillotines and loads of other interesting bits and bobs. 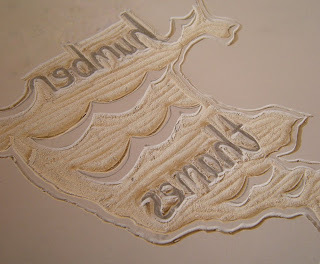 ...at a big lino block I'm cutting at the moment. Yesterday we had a lovely trip to Big Blue Sky, a really nice shop in Wells up on the coast, where everything is made in Norfolk. They're going to be stocking some of our work this autumn, which is very exciting.